When companies have booths or tables at conventions or trade shows, it’s important to look sharp and stand out. You want to make sure your table is presentable, any giveaways you have will make a lasting impression, not “great, more clutter I don’t need”, and your employees look good as well. 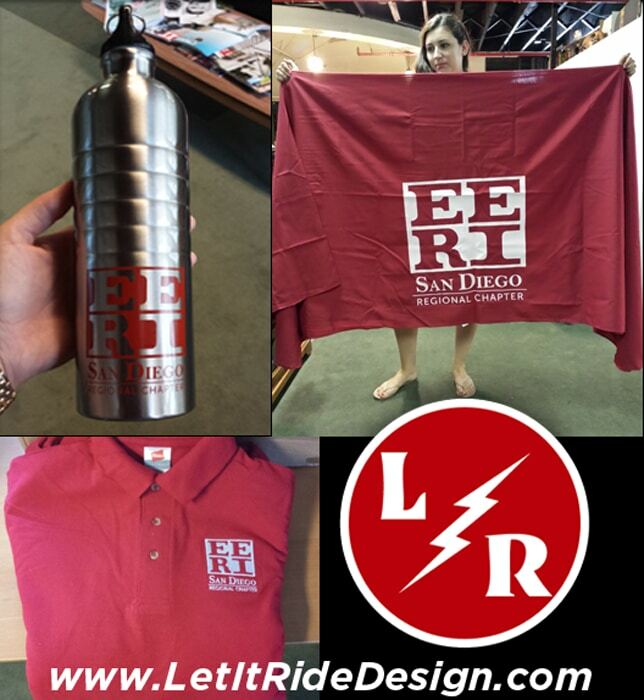 That’s why our clients, EERI the San Diego Chapter, came to us for their printing needs. First off they wanted polos with their logo embroidered on the front left chest. The polos were red with white thread for the embroidery. Simple and clean but yet made a statement. Embroidery looks very professional on a polo, perfect for trade shows, meetings, company outings. So now that the employees are looking sharp, let’s move on to the presentation. The had a trade show table that they needed dressed up. Noone wants to have all of their items sitting on one of those ugly, boring tables. Getting a personalized table cloth is a great and simple way to do that. With table cloths, because of the bigger print area, we use a plotter cut vinyl film that is heat sealed onto the front of the cloth. The client went with a red cloth and white print. Lastly, the giveaways! There are so many different options to choose from that Let It Ride can help create. Such as stress relievers, pens, notepads, chapsticks, the list goes on and on. This client wanted to go a little beyond the realm for this event, so they opted in for custom stainless steel sports bottles. This is a great option because the bottles are reusable which a lot of people appreciate nowadays and is an extra reminder of your company every time they use the bottle. The bottles were pad printed with the companies logo in red. Let It Ride can help with anything your company might need for trade shows, meetings, or just for everyday use. Whether you’re looking for banners, (retractable or not), table cloths, giveaways, shirts, hats, bags, the sky’s the limit when it comes to your needs. With Oktoberfest right around the corner, why not get some items for your party? Custom invitations, beer steins, cocktail napkins, banners, vinyls for your beer pong table announcing your annual party? Let Let It Ride Design help set you apart from the rest. Shoot us an email with your ideas and we can get you goin. Have an idea for your invitations with that hot German beer wench, but when you draw it out, it looks more like Herbert from Family Guy? Let us know exactly what you want and we’ll take care of you. If Let It Ride creates your artwork and you order your merch from us, we’ll always cut you a deal.